From a rear window sticker to a tax disc holder, from a packaging label to a small piece of computer cut lettering for a window, Ascension are specialists in all forms of labels. 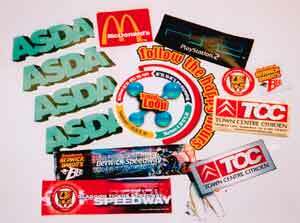 Our unique print and cut system allows us to print onto a massive range of self adhesive materials, including vinyl, plastics and paper. Whether it is a one colour job or a 10 spot colour job nothing is a problem. You need photographic images (otherwise known as process or CMYK) no problem, you need something printing as bright shiny chrome or gold chrome no problem. Our system produces permanent labels and stickers which are just as much at home outdoors as they are indoors. 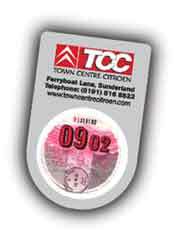 Infact even the label or sticker with the toughest of lives we guarantee for a minimum of 5 years. A list of materials we can print onto appear to the left of the screen. Take a look then ring us with your requirements, usually we can turn a sample around in 24 hours. 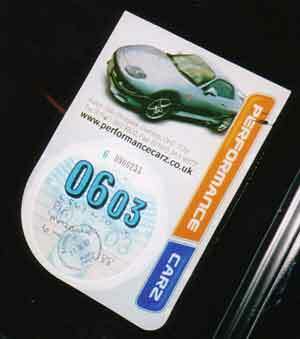 By lining up a pre printed registration mark, we can then cut that label to any shape. Just take a moment to think about it, the applications are endless. We can accept artwork in any form and even produce you a prototype without having to pay for costly set up or tooling charges.